How do you plan for a baggage-heavy trip? We didn’t. The Korea sourcing trip was gonna be intense. Not my father’s or my first time back to Korea but it would be for my mother. And when you finally make your return to the place you ran from, there’s guaranteed big feels and mixed emotions. So we kept it true to RAD AND HUNGRY form – no master plan, just positive energy and hopin’ for lots of random-turned-magic moments. Yes, I had to score goods for the STMT Kit x Korea, but I wasn’t stressin’ it. I had a list of my fave Seoul stationery spots mapped out. My mom had a list of food she couldn’t wait to grub on. The dish she was most excited about? Odeng from Busan, her hometown and the place for the best. Odeng is fish cake on a skewer that’s boiled in broth. It’s the meatloaf of the sea – mashed up seafood with other ingredients formed into patties. Eomuk is the original name, odeng is the bastardized-turned-popular name. It’s inexpensive and M’THR F’IN grubbin’! 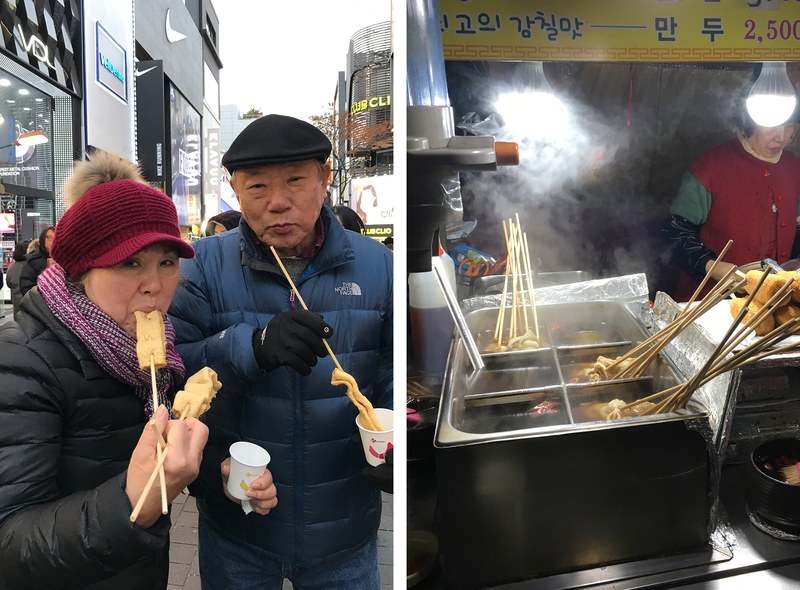 We got our first fix of odeng in Seoul’s hip Myeongdong neighborhood – a maze of alleys that’s all about trendy shops and bumpin’ food carts. In Busan, we hit up pojangmachas – grimey tent-covered food stalls dotted along busy streets. Koreans be big on ‘em – a symbol of survival sprung from Korea’s post-war independence providing affordable food for so many. You can spot them in almost every Korea drama, and everybody frequents them – no matter their status. We also grubbed on odeng at a fast food chain, Jaws Tteokbokki, and at a super cute cafe, Yoonha Kimbap. The preferred way of locals, and my fave way to get my Odeng grub on? Pojongmachas. ‘Cause it always tastes better especially when the weather is freezin’... huddled under the tarp, next to a steamin’ cart, stuffin’ face and washin’ it all down with a cup of pipin’ hot broth. Eat a skewer or two, then grab a cup and scoop yourself some broth. If you don’t see a tower of disposable cups within easy reach, ask for one. Don't skip the broth – it’s like orderin’ moules-frites and not dipping the fries in the sauce! Odeng – I get you. Fast food that goes from rockin’ the street in slick food carts bumpin’ k-pop to weathered joints stampin’ time with their layers of grime to cuteass spots dishin’ up magic-filled meals filled with mad amounts of love. And no matter the place or presentation, you always be keepin' it real. Comfort food to the core.